Although pet food has been around for ages, not too much is known about how the act of boiling the leftover supper into something a bit digestible translated into commercial canned goods. In the beginning of time, pets did not have the luxury of “real” pet food, store bought and paid for. It was a practice that came much later. 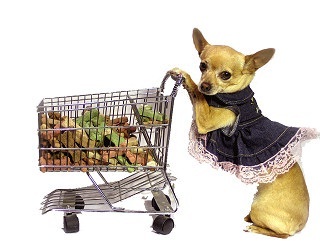 Although some pet owners prefer to make their pets food at home, most others prefer the convenience of buying it from the store, opening the can, and putting, readymade, into the dog bowl. It sure saves time. But where did the invention of dog food come from? In the beginning, dog food was not made on purpose it was mostly mother's experimental dishes that weren't palatable enough for the rest of the family, or the leftover food that nobody cares to eat. The very first commercial dog food was invented in 1860, and came in the form of a simple dog biscuit. A young electrician and seller of lightning rods, from Ohio named James Spratt was on a sales trip. While sitting at the dock in England and awaiting the ship back to his beloved America, he noticed that a sailor was throwing leftover hardtack to the dogs on the dock. Hardtack is a dry cracker-like biscuit made from flour, water, and—if they could afford it—salt. Sailors could use it as rations and store it for many months without it going bad. Of course, many sailors got pretty bored of it, and sometimes threw it to the dogs once they sailed back to the dock! The poor dogs, skinny and hungry, on the English dock eagerly grabbed at the leftover remains of the hardtack. James Spratt felt sorry for the poor beasts and soon invented his own solution to the problem—bone shaped dog biscuits made from wheat, vegetables, beetroot, and beef blood. With time, Spratt started a company for the manufacturing and selling of dog biscuits. The company soon thrived, and in 1890 James Spratt returned to American soil and renamed his company “Spratt's Patent Ltd”. The company did so well that later it broadened its production to other feed stocks and even veterinary medicines. Little is known about the genuine scientific-reasoning behind Spratt's biscuits, feeds, and medication, but still, it was a step in the right direction. Later, other American firms began to enter the market with their own variations of Spratt's biscuit for dogs; some of these included the concept of kibble. These days better, more bona fide companies like Arden Grange, Royal Canine, Whiskas, Felix, and IAMS have stepped forward to make their mark in the history of dog food. Brands, like Arden Grange, for example have a wide variety of dog food to choose from. Some foods are frozen or freeze-dried, dehydrated, fresh or refrigerated, homemade, or vegetarian. Freeze-dried dog food is packaged in a raw and unprocessed form. The concept with this type of dog food is that it has skipped the processing stage and has more nutritional integrity. Most of these products are freeze-dried or frozen to allow it a longer shelf life. Dehydrated dog food comes in two kinds, both raw and cooked. This type of food is generally air dried so that the moisture is reduced, hence diminishing bacterial growth of any kind. Dehydrated dog food looks alot like kibble. Adding warm water to the food before feeding your dog allows the food to become more palatable and easily digested. Fresh or refrigerated dog food is food that has been produced through the pasteurization of fresh ingredients. The ingredients are slightly cooked, sealed into a vacuum pack, and then refrigerated until served. Homemade dog food is diet food for dogs that often comes in take-away-style buckets or Tupperware-like packages. These diets have cooked meat or raw meat, ground up bones, pureed veggies, taurine supplements, and other vitamins in it. Most homemade dog food is actually made at home and later sold to specialty stores and over the internet. Many pet owners these days prefer homemade dog food because it has less preservative in it. Vegetarian dog food, as the name suggests, contains no meat whatsoever. This type of dog food usually has ingredients of oatmeal, pea protein, and potatoes instead of meat. Some pet owners prefer to feed their dog vegetarian food for ethical reasons, and others for health reasons or food allergies. To know more about what your dogs can eat and what cannot, you can visit the site US Bones which will give you a very good idea. You will also get a lot of free tips as well.